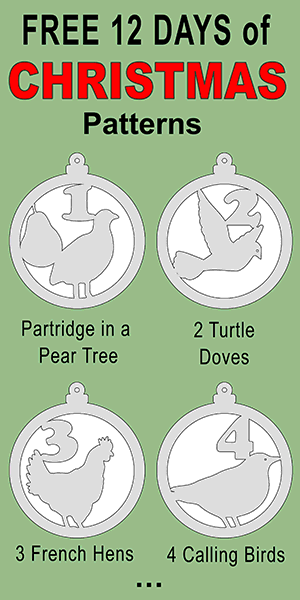 Free 12 Days of Christmas printable, DIY Tree Ornament patterns you can cut out with a scroll saw, laser cutting machine, or color and use for crafts or Christmas decorations. Also see Curly Christmas Ornaments (A-Z) and DIY Christmas ornament and other Christmas stencils. 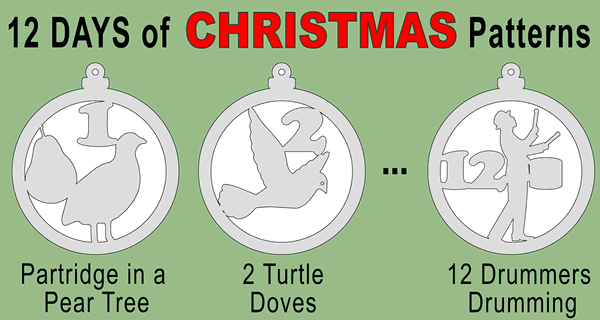 Select and print your ornament designs. Use a spray adhesive to attach your template to a thin piece of plywood (approximately 1/4 inch thick). Cut out your design and hang! If there is a pattern you would like to see here. Just let us know and we will give it our best effort!